The year 2015 heralds a proud moment for the Rolex Fastnet Race. This famous offshore classic celebrates its 90th anniversary and the two yacht clubs deeply associated with the competition, both long-term partners of race sponsors Rolex, toast their own significant milestones. After ninety years of exploits and triumph, the race remains an icon of international sport and an integral part of Rolex's proud association with yachting. Anticipation for the 2015 edition, which starts from Cowes on Sunday 16 August, has been heightened by the anniversaries and the prospect of several new high-profile entrants. 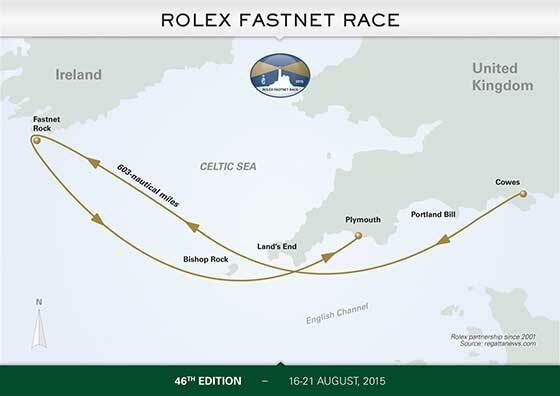 Entries for the 2015 Rolex Fastnet - the 46th edition of this biennial event - filled within an astonishing 24 minutes. A fleet of around 350 international yachts are expected to participate, with a potentially record number of race starters. Featuring yachts from over twenty countries, the entry list is as always both international and diverse. Mighty multihulls (including Spindrift, multihull line honours winner in 2013), and some of the world's most impressive 100-ft monohulls (comprising Jim Clark's recently launched Comanche, which made an impressive debut at the 2014 Rolex Sydney Hobart) will set the pace in the quest to grab the laurels and headlines as the fastest boats. The likes of George David's new 88-ft Rambler and Maxi 72s Bella Mente and Jethou will represent the best in professional sailing talent while the core of the fleet will be the hundreds of Corinthian crews for whom the race is as much a personal challenge and rite of passage, as it is an opportunity to win one of the biggest prizes on the international yachting stage. The prize for overall victory on handicap is a target for any boat in the main fleet. The Royal Ocean Racing Club (RORC) was founded directly after the first Fastnet Race in 1925. The club has grown into a global leader in ocean racing and organises the Rolex Fastnet Race, held biennially since 1931 (except for a break between 1939 and 1947), with diligence and authority. A partner club of Rolex since the 1990s, its contribution to this segment of yachting is widely admired both inside and outside the sport and Rolex is proud to enjoy a privileged relationship with one of the sport's true influencers. The Rolex Fastnet Race starts from in front of the Royal Yacht Squadron (RYS) in Cowes, and has done so each year since 1949. The sight of some 350 yachts spread between the Isle of Wight and the mainland, all preparing for the start of a great offshore race is a spectacular moment attracting crowds on the shore and the water all the way west to The Needles. The Squadron, as it is universally known, is one of the world's oldest yacht clubs, and 2015 marks its bicentennial. The club has a huge pedigree within yachting, and its preeminent status is founded on a mix of exclusivity, tradition and active, influential organization. The Rolex Fastnet racecourse is fabled and when the British Isles weather delivers the conditions typical of the time of year it is a true test of human endeavour. The 603-nautical mile course takes the intrepid fleet from Cowes, on the Isle of Wight, around the Fastnet Rock off the South West coast of Ireland and back to Plymouth. It is a complete challenge, testing all aspects of yacht racing including manoeuvres, tactics and strategy, along with preparation, endurance and determination. Like all great ocean races, the Rolex Fastnet Race has a symbol. The Fastnet Rock, located on the southern tip of Ireland, is a mesmerising sight for sailors. On rounding it, the fleet begins its return passage to the finish in Plymouth. Pascal and Alexis Loison are the defending champions on Night and Day. In 2013 they made history in becoming the first double-handed (two man) crew to win outright the Rolex Fastnet Race. An outstanding achievement considering the might of the competition the duo faced and the extreme demands on physical and mental resources such a race poses. The Loisons return this year, and any hope of repeating their success will be tempered by realism. Only three crews - Myth of Malham (1949) Carina (1957) and R�n 2 (2011) have successfully defended the Fastnet Challenge Trophy since the Second World War. Competing in the Rolex Fastnet means different things to the more than 3,000 different people who will be on board the 350 yachts entered this year. For some it is a once-in-a-life-time personal challenge, for others it is part of a much bigger picture, part of a lifetime of sailing. It is never just another race. It is not to be undertaken lightly and each boat and crew must meet strictly applied entry regulations before being accepted. The list of well-known names who have competed over the 90-year history of the race includes businessmen Sir Charles Dunstone, Noel Lister, Niklas Zennstrom and Sir Maurice Laing, media mogul Ted Turner, libel lawyer Peter Carter-Ruck and newspaper magnate Sir Max Aitken. The race has been touched by politics with former Prime Minister, the Right Honourable Sir Edward Heath and popular culture by Simon Le Bon of Duran Duran. There are those who have a particularly intimate relationship with the race. Octogenarians Ken Newman (a record 28 participations) at the age of 86 and Dutchman Piet Vroon, at 85 (the overseas competitor with most appearances: 26) will again participate. Vroon has missed just two editions of the race since the early 1960s and his crowning glory was overall victory in 2001 on Tonnerre de Breskens. The Rolex Fastnet may have a distinctly British flavour but it is by no means a strictly British contest. Over a third of the competing yachts, and nearly half the competing sailors, come from overseas and the reputation of the race stretches far beyond the British Isles. French triumphs have been part of the recent landscape. As well as the Loisons' double-handed win in 2013, Jean-Yves Chateau guided his Corinthian crew on the tiny 33-ft Iromiguy to victory in 2005. Yachts from across the "La Manche" regularly comprise 20% of the fleet. Other countries to boast a notable Rolex Fastnet heritage include The Netherlands, Sweden and the United States with overall winners also coming from countries as far a field as Australia and Brazil. The Rolex Fastnet Race is an iconic event in the international yachting calendar. It forms an integral part of Rolex's association with 600-nm endurance races which also includes the Rolex Sydney Hobart Yacht Race and the Rolex Middle Sea Race. Further details on the Rolex yachting calendar can be accessed here. regattanews.com is the comprehensive media source for the events that form the Rolex Yachting Portfolio. Incorporating media-driven features, regattanews.com is the reference point. In addition to high-resolution images, the regattanews.com online media centre offers photo stories, press releases in numerous languages, exclusive, lifestyle-oriented feature articles, the complete event calendar and direct access to regattanews.com social media platforms.